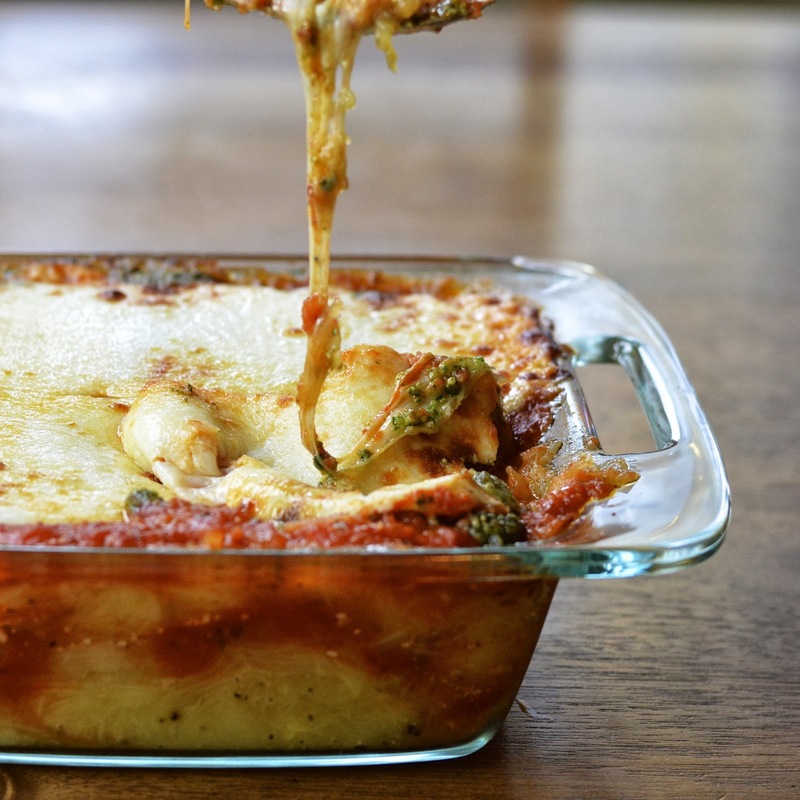 I absolutely love spaghetti squash and this spaghetti squash lasagna is right up my alley. Seriously, I did not miss the layers of pasta. And as my husband says, “we could eat pasta every night and not get sick of it!” This spaghetti squash lasagna is so flavorful, garlicky and cheesy; the squash is just a lovely accompaniment to the rest of the Italian goodness. Even my kids who are not big squash lovers gave this lasagna a whirl, and cleaned their plates. I also happened upon a really cheap box of organic basil at the grocery store a couple days ago and did not want it going to waste. With the leftover walnuts from Thanksgiving, I made this beautiful basil walnut pesto. It really gives this dish the extra wow factor it so deserves. This dish is incredibly easy to prepare. The spaghetti squash is easily microwaved and cooks in less than 20 minutes. I used a jarred tomato sauce and thinly sliced the mozzarella instead of grating (honestly-I hate grating!). If you are really pressed for time just buy a prepared pesto. You can have a delicious and healthy dinner within 45 minutes! Place squash, cut side down in a microwave safe glass container. Cover with plastic wrap and pop a couple small holes in it for venting. Cook on high for 15-18 minutes or until squash is soft and scrapes away from skin like spaghetti. Scrape out all of the squash and place in a strainer. gently press the squash so it releases some of it's liquid. Toss squash with olive oil, salt and pepper. In a two quart casserole, layer half of the squash on the bottom. 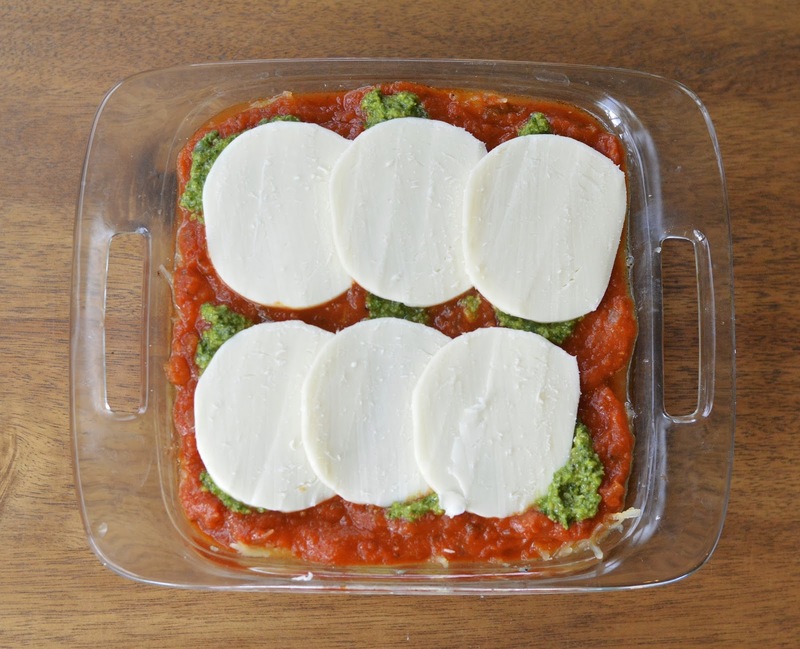 Top with 1 cup of tomato sauce, 6 heaping tablespoons of pesto and half of the sliced mozzarella. Add the second half of squash and layer the rest of the ingredients in the same order. Top with a sprinkling of parmesan cheese. Place in center of oven and cook for 20-25 minutes or until sauce is bubbling and cheese in golden brown. Let sit for 5 minutes. Put all of your ingredients into a food processor and blend until smooth. I prefer walnuts! Nice flavor and some pine nuts are tainted and can make me really sick. They call it pine nut mouth - which sounds silly but it's bad! This looks delicious! I adore all forms of winter squash. Truly, you're such a talented recipe artist and I really enjoy your blog! :) I'm not a big pesto fan, but you could probably leave it out, right? You always make my day Heather! You can definitely leave out the pesto. You can also add in a little bit of ricotta - about a cup in the middle layer. It would add a nice creaminess. I make everything with walnuts! 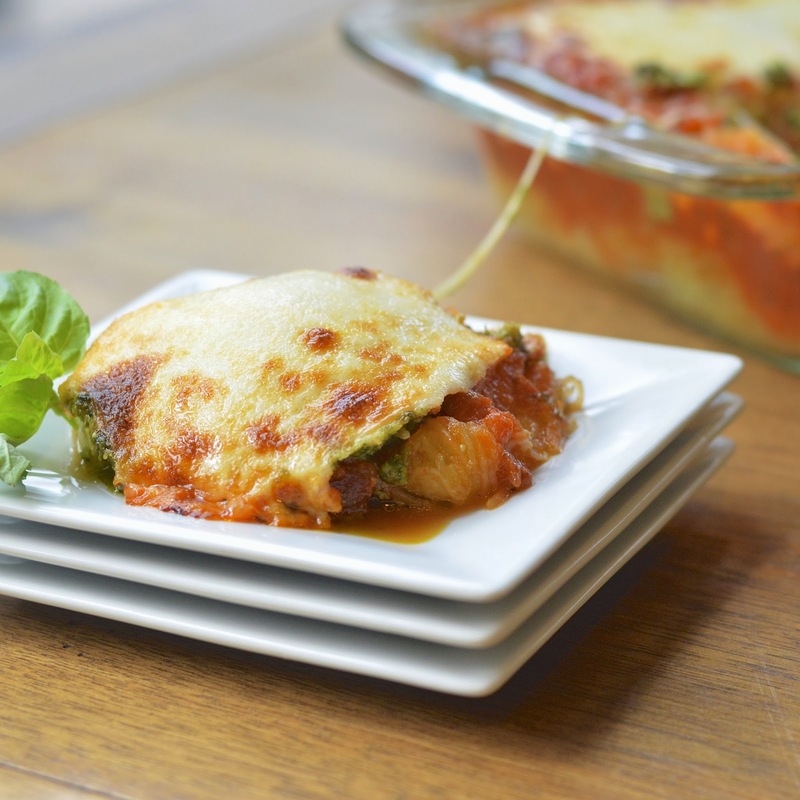 Love the idea of using the spaghetti squash as the lasagna noodles! Yummy!!! Looks delicious and I am already dreaming that plate with a nice red wine! Thank you! I've made this three times now. It is one of my family favorites!! Thank you so much for sharing! Thanks so much Nicole. Glad you all enjoy it!